Nettleship, David N.. "Seabird". The Canadian Encyclopedia, 04 March 2015, Historica Canada. https://www.thecanadianencyclopedia.ca/en/article/seabird. Accessed 24 April 2019. Seabirds are those bird species which spend long periods away from land and obtain all or most of their food from the sea while flying, swimming or diving, and occupy all of the world's oceans. 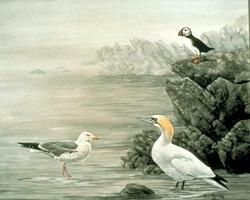 Atlantic puffin (top), herring gull (left) and northern gannet (artwork by Claire Tremblay). Seabirds are those bird species which spend long periods away from land and obtain all or most of their food from the sea while flying, swimming or diving, and occupy all of the world's oceans. Some are inshore feeders, while others feed offshore foraging over deep water in pelagic regions out of sight of land and independent of it for both feeding and resting. The group comprises 4 taxonomic orders (see bird classification): Sphenisciformes (penguins), Procellariiformes (albatrosses, fulmars, prions, petrels and shearwaters), Pelecaniformes (tropicbirds, pelicans, cormorants, gannets and frigatebirds) and Charadriiformes (skuas, gulls, jaegers, terns, noddies, skimmers and auks) - totalling 15 seabird families and about 315 species worldwide, all of whose evolutionary histories have been principally marine. In Canada there are 8 families, 64 species, 48 breeders, 16 regular non-breeding visitants and 1 extinct species, the Great Auk. Some marine-associated birds such as loons, grebes, sea-ducks and phalaropes are also sometimes referred to as "seabirds," but these have been shaped largely by terrestrial and freshwater systems and have become only secondarily adapted to the sea. Seabirds display a marked non-random pattern of distribution in their marine environment. They return to land to reproduce, often forming immense single-species or mixed-species colonies. These breeding places represent compromises between the oceanographic conditions that provide an adequate and predictable food supply and landsites within range of this food source with available nesting sites and few ground predators. Locations meeting these requirements are few. During the non-breeding season, the birds are usually restricted to nutrient-rich waters and/or upwellings and "fronts" or other oceanographic mechanisms that bring food to the surface and concentrate it there. One obvious consequence of this clumped distribution throughout the year is a high risk of exposure of seabird populations to pollution and other hazardous human activities. Direct exploitation of seabirds for food, oil, fish bait, fertilizer (from guano) and clothing is now small throughout the world, with subsistence hunting restricted largely to developing countries. However, unregulated or inadequately managed hunting of seabirds continues in certain developed nations, including Canada. 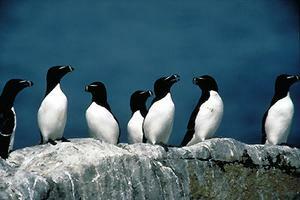 Thick-billed and common murres are hunted in coastal waters off Newfoundland and Labrador. Hunted only by residents of Newfoundland, a traditional hunting right given them soon after they entered Confederation in 1949 (the only non-native people allowed to hunt murres in North America), no daily bag limits or total annual harvest quotas were established until 1994. Although regulations now exist, enforcement is difficult and unlikely to prevent further reductions in population sizes and colony extinctions. But as serious as overexploitation is to murres and other seabird species, the most serious current threats come from the indirect effects of other human activity: pollution or interference that affect the birds directly at sea (oiling, entanglement and drowning in fish nets) or when they come ashore to breed (introduced alien animals, artificial increases in natural predators, human disturbance, tourism), or indirectly by altering the quality and quantity of their food (fishery developments and over-harvesting of foods important to seabirds, contamination by persistent chemicals). Global warming also poses an ominous threat. Precisely how these disturbances and environmental stresses are affecting marine life and ecosystems is by no means clear. But some seabirds are now showing marked changes in population size and status, changes known to be associated with the widespread industrial expansion and marine resource development occurring in all oceanic zones. Some species have undergone serious declines in numbers and require immediate action to reduce the chances that they will become endangered. Others have exploded in numbers and come into conflict with humans by becoming pests through fouling of urban and rural habitats, or by competition for food and transmission of diseases. The 2 contrasting patterns of life history that have evolved among seabirds can explain the vulnerability of certain species to environmental changes. "Generalist" species are opportunistic and adaptable, often able to take advantage of human-induced changes in the marine environment; "specialist" species, on the other hand, are tied to a particular set of conditions, cannot adapt easily to change, are highly vulnerable to human disturbance of coastal waters and habitats, and have shown steady decreases in population size. Analysis of trends of Atlantic seabirds over the last 75 years indicates dramatic growth of generalists such as Northern fulmar, black-legged kittiwake and large Larus gulls such as the herring gull and great black-backed gull. Increases appear to be caused by the explosion in quantity of the artificial food supply made available by expanding fisheries and human populations. 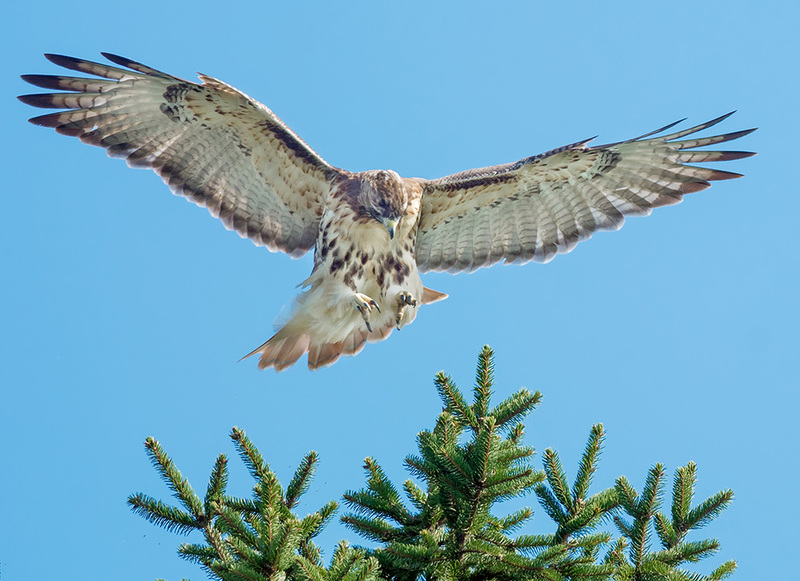 Specialist species, including storm-petrels, terns and the auks, have decreased in numbers. Overall, the future of the specialist seabird species must be considered precarious, particularly as human disturbance is likely to be even more extensive in the future. The present conservation needs for the world's seabirds, particularly the more specialized colonially breeding species, require the total protection of the most important breeding colonies (land and adjacent waters) and key feeding areas both inside and outside the breeding season. Sites used for reproduction require protection from the many sources of human disturbance, both direct and indirect. 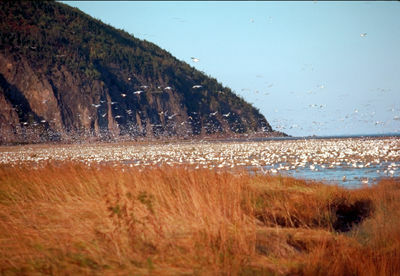 In Canada, federal and provincial bird sanctuaries and wildlife areas provide some protection for breeding seabirds such as Prince Leopold Island, (Northwest Territories), Île Bonaventure (Québec), Machias Seal Island (New Brunswick) and Funk and the Witless Bay islands (Newfoundland), but the percentage of important breeding colony sites with official protective status is small, particularly in Arctic Canada. Overall, a national and international system of enforcement must be developed to ensure that regulations are respected and effective in the attainment of management and conservation objectives. 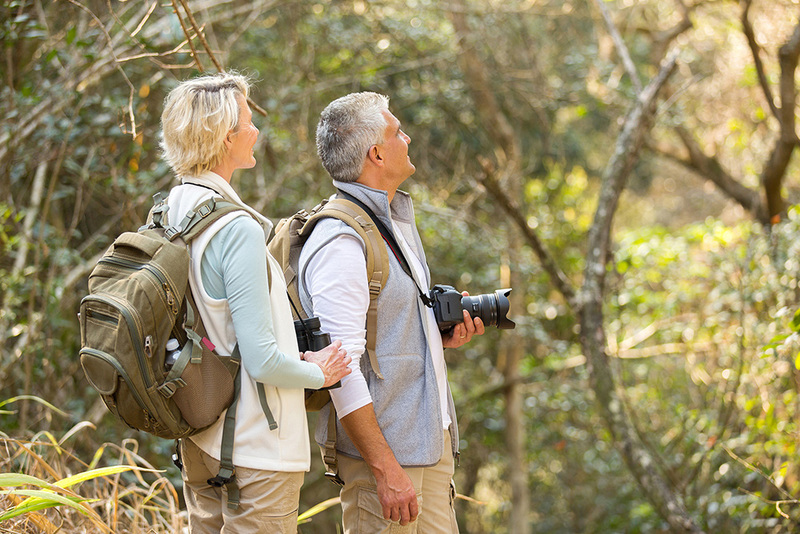 See also Endangered animals; Wildlife conservation and management. J.C. Bartonek and D.N. Nettleship, Conservation of Marine Birds of Northern North America (1979); R.G.B. Brown, D.N. Nettleship, P. Germain, C.E. Tull and T. Davis, Atlas of Eastern Canadian Seabirds (1975); J.P. Croxall, P.G.H. Evans and R.W. Schreiber, Status and Conservation of the World's Seabirds (1984); J.P. Croxall, Seabird Status and Conservation: A Supplement (1991); J. Fisher and R.M. Lockley, Seabirds (1954); R.W. Furness and P. Monaghan, Seabird Ecology (1987); B. Nelson, Seabirds: Their Biology and Ecology (1979); D.N. Nettleship, "Seabird Resources of Eastern Canada: Status, Problems and Prospects," in Canada's Endangered Species and Habitats (1977), "Long-term Monitoring of Canada's Seabird Populations," in Monitoring Bird Populations: The Canadian Experience (1997) and "Ecosystem Disturbance and Seabirds in Crisis: Eastern and Atlantic Canada," Proceedings of the World Wildlife Fund Atlantic Canada Workshop on Recovery of Species at Risk (1998); D.N. Nettleship, G.A. Sanger and P.F. Springer, Marine Birds: Their Feeding Ecology and Commercial Fisheries Relationships (1984); D.N. Nettleship, J. Burger and M. Gochfeld, Seabirds on Islands: Threats, Case Studies, and Action Plans (1994); K. Vermeer and K.H. Morgan, The Ecology, Status, and Conservation of Marine and Shoreline Birds of the Queen Charlotte Islands (1997).